TGF - Release Day BLOG HOP!! Happy Saturday everyone! It’s hard to believe October is already over. But the good news is that the NOVEMBER RELEASE is now available in the TGF store!! These new stamps would make awesome gifts…hint, hint! You know your crafty friends would love some TGF in their lives. As always, you have a chance to WIN the entire release! I think you’ll agree the DT cards are AMAZING! You’re in for a real treat as you blog hop with us today! One lucky winner who visits all of the DT’s blogs, comments, and comes back here letting us know they did will take home the ENTIRE NOVEMBER RELEASE from THE GREETING FARM! For my final card I used Cheers Anya again, so versatile. The greeting is from Hero Arts. Patterned paper used is from Simple Stories - Homespun collection. The scalloped rectangle and the stitched rectangle used for the vellum are cut with Mama Elephant - Index Card Creative Cuts. You have until 11:30pm CST to complete the hop and enter to WIN! Winner will be announced on the blog on Monday, and on our FACEBOOK page, so stay tuned! I love this Anya image! Is she trying to share that champagne or is it all for herself? Share the wealth, Anya! The image is so cute! And the fact that it's on vellum is just amazing! Loved all your beautiful creations for the November release. Thank you for sharing. Ooooh this is super cute!! She's very sweet. Love the colors you have used to make her blonde. Love all of the little details and velum to show off the background paper. Nice job. I love how she is the main focus on this card. There isn't too much going on. And your coloring work is amazing. Great job! Thanks so much, and happy crafting! Cute... 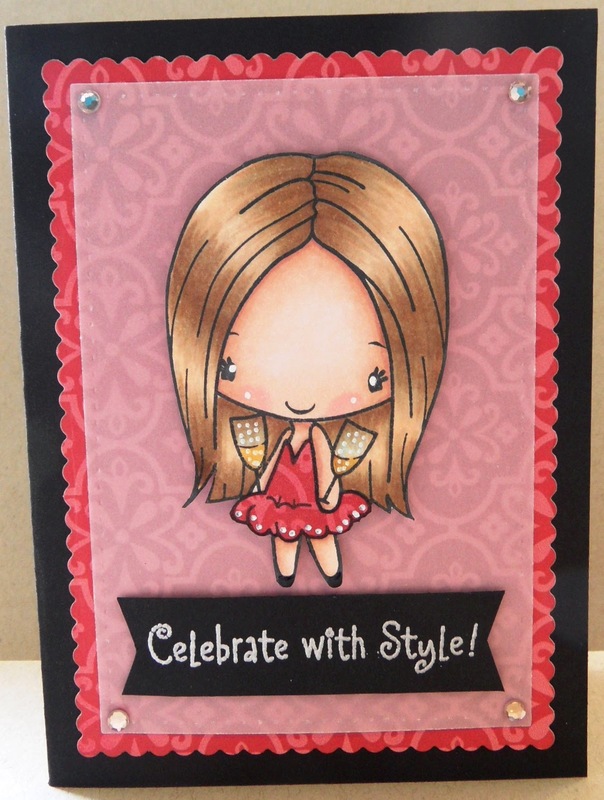 I love the use of vellum... What die did you use on the scallop rectangular background. Gorgeousness! I love the was Anya looks like she's stamped onto the vellum! This card is so pretty. Love the colors used and great job on the coloring. Completely adorable! Love your coloring! Such a pretty card. She is cute. oh my she is wonderful how you colored her! love the style of the card. Very cute.